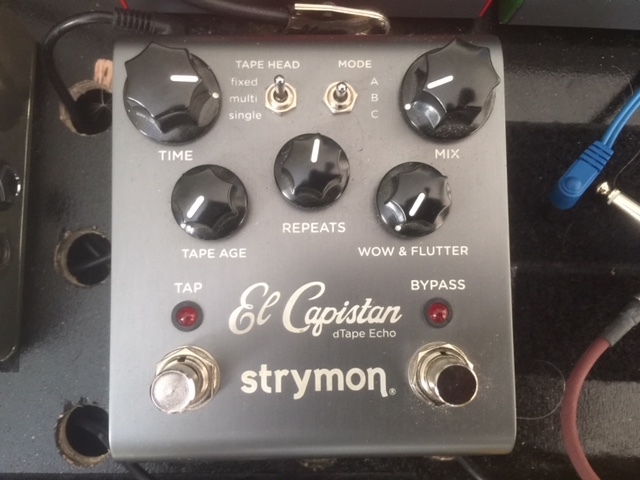 El Capistan, Delay/Echo/Phrase Sampler for Guitar from Strymon. 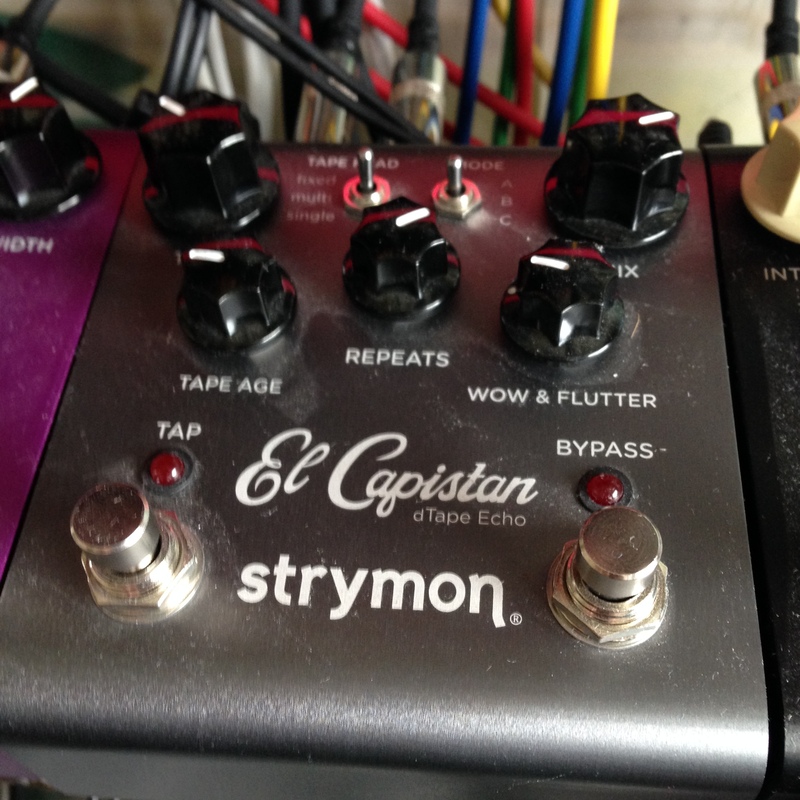 The Strymon El Capistan is essentially the best tape echo emulation on the market. Strymon delivers a feature packed offering that is a dream of knob fiddlers. 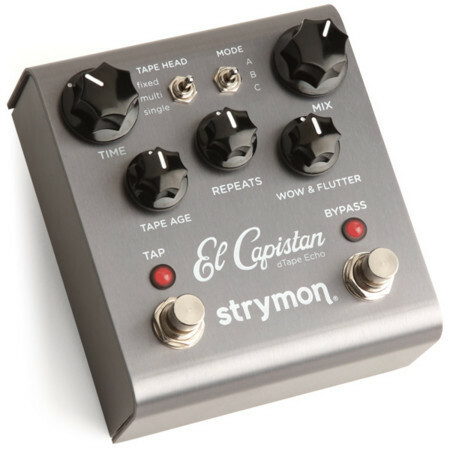 The El Capistan can toggle between three different tape head settings (Fixed,Multi, and Single) each having their own variance on the 3 available modes A,B, and C. The front panel controls include Time, Tape Age, Repeats, Mix, and Wow & Flutter. Holding the bypass and Tap tempo footswitches enables the "hidden" parameters of Low end contour, Tape bias, Tape crinkle, a +/- 3db cut/boost, as well as spring reverb. The pedal's looks, like all Strymon pedals, are elegant and clean. A great looking unit to add to your board. The versatility of the I/O allows you to run the pedal in a stereo environment. It also allows you to connect an expression pedal to be configured with any parameter or one of strymon's favorite switches to recall a particular patch. The amount of control Strymon gives you makes it very easy to get a good sound out of the unit. 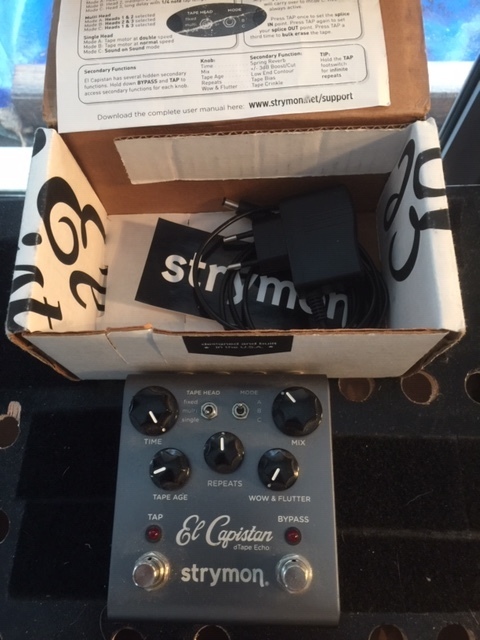 The El Capistan runs 9v power. The Strymon delivers excellent sound utilizing the SHARC DSP. Matching the single tape head with mode C selected offers sound on sound mode. This mode acts like a pseudo tape-looper. Using the Tap tempo switch you can control "splice" points and then use the parameters of the pedal to alter the loop. Taking advice from the Strymon website directly, setting the pedal up with a single tape head on mode A can elicit very subtle, natural sounding echoes with distorted guitars. You can use the Tape age knob to dial in the right amount of crispness desired. 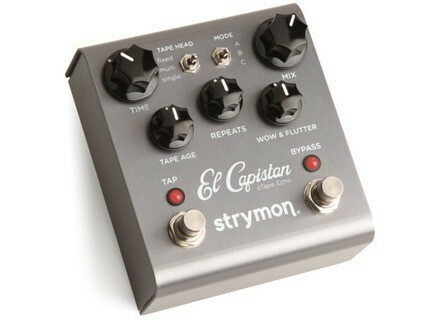 The Strymon El Capistan is a very impressive delay. The only thing that comes close to it's sound quality is the JHS Panther which dwarfs the Strymon in price. The amount of control you are given is very inspiring and gives you a sense of fulfillment in your purchase. I am very awed by this company's work. Top notch pedal indeed. There are three modes available. These are fixed, multi and single. They each emulate different types of tape echo such as the Echoplex and Space Echo. Of course this emulation is digital. A complaint I have is the lack of MIDI and lack of stereo ins. This would bring the functionality level much higher, though it's not the biggest of deals. You at least get stereo outs and tap tempo and can purchase the Favorite Switch if you want a preset. Downside is it's $50 extra. There are five knobs, mix, time, repeats, wow & flutter and tape age. Each knob has a secondary function to control parameters such as crinkle, bias, spring reverb, etc. These allow detailed control over your echo tone. You also have the ability to switch between buffered and true bypass operation. The primary knob functions are self explanatory, though those unfamiliar with tape echos may not know what the effect of tape age and wow & flutter are. Fortunately, the manual explains these. The secondary knobs are a bit trickier since you probably won't know about them without the manual. The manual explains them and how to access them, though it is a bit of a PITA to actually do it. Set up is easy, though as before it may cause some problems in a stereo rig since it doesn't have stereo ins. It's easy to incorporate in any other rig though and the favorite switch is a breeze to hook up should you choose to purchase it. The high current draw can give you problems depending on your power supply and other pedals, though I just run it off output 5 or 6 on my Voodoo Labs Pedal Power 2+. I use the El Cap with a THD Flexi 50 and a Strat. The dry tone remains unaffected when I kick the El Cap on due to the analog dry path. This gives it the edge over several similarly priced units such as the Eventide Time Factor in my opinion. The echo quality is great. It can get very close to the EP-1 that my friend owns. If it had a similar preamp structure in place, I believe it could nail it no problem. There's a thread on the Gear Page that compares it to several real tape echo units that gets the point across very well. My only complaint sound wise is that the self oscillation is a bit weak. Nowhere near as prominent as a real tape echo or even most analog and digital echos. This isn't a deal breaker for me or most others but it is nice to have around for when you want to go crazy. I absolutely love the El Cap. It does everything I need and it's built incredibly well. My favorite thing would have to be the multi head setting. It gives a great ambient feel to my tone that I love for when I'm the only guitarist. My complaint is still the oscillation. I feel like Strymon could have done better. The value might not be as good as something like the Time Factor since it only does 3 types of delays but it does those 3 types so well that if you're only looking for tape echo, I'd buy this any day over the TF. I'd buy another if it were ever stolen or broken. The former is considerably more likely. Many possibilities: 10 faders with secondary characteristics, and 9 possible combinations of switch! Can connect the pedal in stereo. This is a pedal that must be tamed! As mentioned above, there are a lot of possible settings. The choice of heads defines "rhythm" of the delay. Very convenient, you can make a delay in black or note, or make syncopated stuff via the multi-heads. You really adjust to the ear and take your time to see what rhythmic form is best suited to what we play. Then different potentiometers allow us to set all functions of the tape delay. - Repeat the number of repetitions with a high degree can be easily from self-oscillations (also feasible now tap tempo supported) The self-oscillation may also seem trivial, but it can be great to make mounted in a piece for example. - Mix: the level of delay. Note that you can remove the dry signal completely. - Low end contour, can remove the low delay. I have a little more trouble to use it, it can help to reduce the delay compared to the dry signal. - Tape crinkle which adjusts the mechanical noise. I have difficulty seeing the effect of this potentiometer Indeed, it is far from the effect "vinyl striped", sounds are light. Here: needless to say it will have to redouble patience and ingenuity, and can be very precise in setting the tone with this machine! Personally I enjoyed myself as a little crazy to test the possibilities of this pedal, and I am far from having done the trick! Frankly the sound is terrible! We hear about the digital side and "cold" of the pedal, and the famous "veil Strymon" ... Personally, I would say that this is not quite true. I can not find the pedal particularly "cold" with the tape age can be quite warm sounds, even at concert volume levels. Digital by next spring against, but it is not really a problem because we really found the side tape delay of interest. The "veil Strymon" does not bother me too much, and I think the pedal still respects the nature of the amp and guitar, even if it has that strong personality. See if that bothers you or not though. It remains that there is a fleshy and organic side in this delay is simply awesome! The ability to fine tune modulations provides access to a lot of different types, and we find all the sound characteristics of tape delay. For me it is really tip top, listening absolutely! Being a fan of math rock, prog and other ambient rock, I was looking for a delay that would be able to perform several functions: a fairly clean delay and delay allowing the creation of soundscapes. 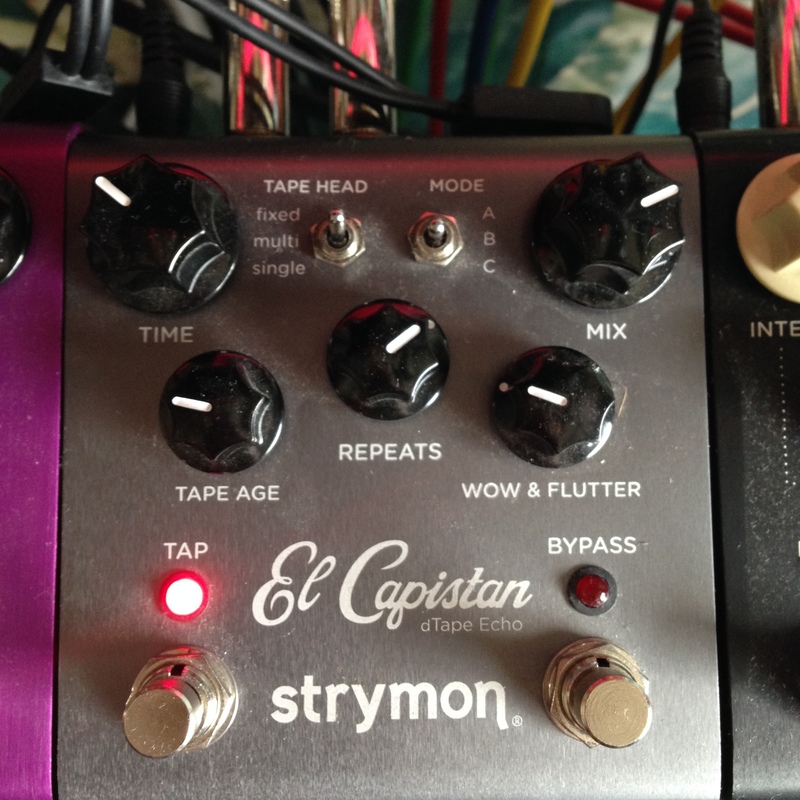 With el Capistan I&#39;m thrilled because I have access to these two types of delay, plus endless variations between the two! I often use it in again, it really is an excellent tool for creating rhythmic or melodic patterns. The tap tempo is really convenient, and self oscillation holding down the tap tempo can really make original stuff. My only regret is the lack of preset. It is very easy to tinker a favorite switch (see on the net), but I think it was really more the pedal is directly supplied with. As it stands, it is rather annoying to have to look between 2 songs to change its delay (not counting the number of parameters to be modified). I think I&#39;d be soon, so keep a type delay "sound sheet" on hand. Another thing I find unfortunate is that the delay "remembers" what is played when changing mode on a head type (eg switch from single mode to B mode), but not when changing head (single multi). Which is a shame because it could have cool stuff with the looper. The new price seems a little expensive. Bourmix's review (This content has been automatically translated from French)" Not convinced!" Bcp options (for me too). The tap tempo is cool! We turn is modified cool, but get the secondary functions taking the supported switches pff I'm confused. It is especially at this point that I want to emphasize. I have Subdecay Echobox (analog / digital) and Capistan seems to me ultra synthetic in comparison. The sound is clean no problem on that, but this is an ultra digital environment that leaves me cold (no heat). I am one of those guitarists who pedal = sound, turn on switch and basta. So Capistan is clearly too much for me level opportunities. Its level I'm not at all hung ultra digital side of the pedal, synthetic sound with this super cold that does not suit me.